As you may recall readers I had mentioned that I had the privilege of co teaching a weekend of workshops and performing with the lovely Kristine Adams of FCBD who has spent the last 4 years travelling the world, teaching and performing ATS(r). I found her adventures extremely interesting not to mention confirming that indeed dance holds no language or social barriers. I really wanted her to share with you just some of her thoughts on ATS(r) around the world. But first, I want to share with you my trip to Canada and the U.S.A. It was my first time in Canada where I was hosted by TriDevi Tribal. These ladies from Edmonton Alberta were extremely generous and lovely hosts. I found the Canadian way more similar to our Aussie culture and less American than I realised I had expected. These ladies like to work and play hard! We danced and danced for days and then basically ate ourselves into a stupor! a push bike open my car door laughing whilst we were driving I decided I don’t like it so much! I guess it’s all the rage in Canada as many of the performers fully embraced the weekends theme for the events showcase. Needless to say it made for a very interesting, colourful and fun show! as performance nights and meet and greets. It was a fun time indeed but especially nice to catch up again with Dayl who used to dance with Urban Turban from Sydney back in the day. I had a lovely time over the Christmas break catching up with old friends and hanging with the family before getting stuck into a project called ‘D’yari – The Gift’ that has received some government funding. It includes 6 musicians. Colin Berryman on sitar, John May on percussion, Peter Kennard on percussion and guitar, Dimitri Vouros on Bansuri, Flute and Clarinet, Muharrem Aslan on vocals and Saz and myself on piano. Dancers were Emily Cooper and myself. The idea for the project was to be able to tell Muharrem’s own personal story of being a Kurdish refugee. In his own country his stories and music were not allowed so to be able to meet new friends that embraced his culture and bring the music and story to fruition was life changing for him. Of course each artist brought their own training and sensibilities to the traditional music and love story Mem and Zin which was told throughout the program. This gave the project a cross cultural feel that Muharrem thought was appropriate as a Kurdish man living in Australia and making new friends from many different nationalities and walks of life. I must say that it was probably the first time anyone had performed classical piano in a traditional Rajasthani Gypsy costume! It did feel strange to be doing that! Putting on projects such as these really excites me as I feel I learn something in the whole collaboration process and it always pushes me out of my comfort zone. I enjoy learning new things and to learn from other dancers and musicians through a collaborative project is very exciting! Whilst rehearsals were in full swing for Dyari I managed to squeeze in my Drills and Appraisal workshops in Sydney which are going from strength to strength AND the debut of BELLYLAB 101 with Achushla from Adelaide. I’m sure that the students who attended BELLYLAB had a wonderful time but for Acushla and I as teachers we too felt like we learnt something in the process of sharing our experiences with them. The whole idea about BELLYLAB is to bring out your own individual quality in your dance through various structured exercises and thought provoking goal planning. We went through time signatures and musicality, how to choreograph and to improvise as well as technique in shimmies, arms layering and more. I’m hoping we can teach BELLYLAB 101 again so if you see it pop up somewhere try to catch Achushla and I as living in different states I doubt it will happen very often. 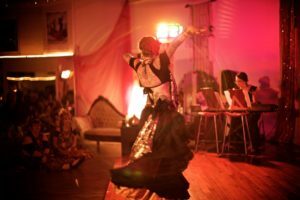 How and why did you start bellydancing? After finishing my degree I found I had a fair amount of free time on my hands and started investing it in dance. For years I had studied Lindy-hop and swing but I longed for a dance form where I wasn’t reliant on a partner to show my skill level. I’m not 100% sure why I chose belly dance. I knew nothing about it except that my boyfriends ex was a dancer and that a friend of mine was taking a class. I think between those two things it was enough to get me into the door of a class. Still to this day I can’t describe what kind of belly dance it was. It was odd and not for me, but it was a stepping stone to getting me into the door at FCBD®. Again not sure about the circumstances that took me to Berkeley that fateful night. I knew nothing about PFatChanceBellyDance®, but I’m glad the powers that be were at work. It’s been an amazing journey since then. How long have you been dancing with Carolena and FCBD? I remember the first class I took with Carolena but I don’t remember the date. I feel like it was either 2002 or 2003. I do remember when Carolena first asked me to join the FCBD® troupe and then when I was brought into the troupe on my fathers birthday June 13, 2005 right after my favourite FCBD® performance at Tribal Fest. I still love watching that video to this day. How did the belly of a traveller tour come about? I come from a long line of world travelers, so in a way I’m genetically predisposed to wanderlust. As a teen I had the urge to travel around the world in one long loop, not rushing, but I just wasn’t sure how I would do it. First I thought through volunteer work, later through the Peace corps (which I never did) then the idea of photo journalism and then I just let that dream fall by the wayside and comforted myself with the occasional jaunt out of the country. Then one day it seemed like all worlds collided. I had been part of FCBD® for sometime. I saw all the travellers that came to us and I saw Carolena go out and teach and I had already been once to Russia to teach and I just thought, well this would be a cool way to spend the next five years of my life, why not. So it began. How long have you been travelling for now? I left my apartment on July 1 2012 and started living out of my bag and off of the good graces of others. My official launch date for the tour was August 20, 2012. I returned to the SF November 24, 2015 but set out to finish the USA portion of the tour in January after Homecoming 2016 and arrive back in SF April 5, 2016.You can do the math, but it’s been a long time without a home, almost 4 years. 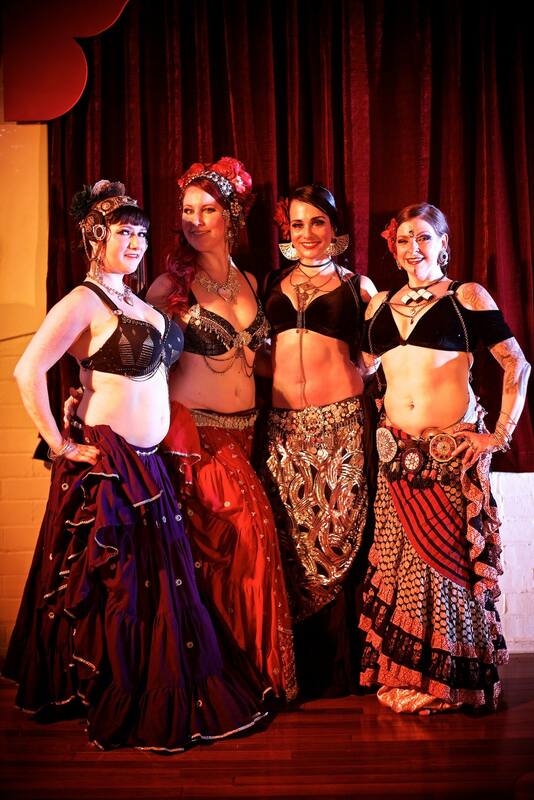 Photos: Sponsors Dani and Sasha of Barefoot Gypsies in Lismore with Devi and Kristine. Kristine dancing to Devi playing her own original composition. Photos by Alex Clarke. I went to as many countries as I could with as much ATS® as I could find, and honestly I found that I was simply scratching the surface of what is out there with ATS®. I saw so much but also missed quite a bit, all in all I’ve been to 70 countries, not all of them with ATS®. Where were your favourite places? You must have felt like ATS has connected you to the world. If so can you talk more about this? I really feel like it has. It was such an eye opening experience to stumble city to city and consistently have some very generous person scoop me up from a plane, train, bus station and take me to their homes, feed me and spend time with me. It was such an honour to be a small part of this strangers life and all because of this beautiful art form. I have been privy to so many personal things in my hosts and dancers around the world lives. I’ve been around for children, break-ups, weddings, so many things, and really it has highlighted the fact that we are all the same. How did you find the different dancers from around the world the same and or different? Now that you are back in America what are your plans? As the old saying goes “there’s no place like home”, and I am so happy to be home.My plans are to slide right back into the world of FatChanceBellyDance®, teaching,performing, traveling, working with Carolena and all the dancers that make it to the San Francisco studio. I’m ready to set some serious roots here and dive into creative work. I’d like to make a book and dvd based off of my trip, but that will take some time. How do you see ATS and Tribal belly dance in general evolving? It’s been such a beautiful process. The little I’ve been privy to we are really part of a self made art form and everything has to start somewhere. I’ve watched people all over the world have a very broad brush stroke when it comes to ATS® and Tribal, mostly people mushing it all together, and now there is much for definition and information keeping the dance forms as separate groups. I feel like it is a very historical time watching the birth of so many different dance forms and being able to see them evolve. I really think about the future and 100 years down the road I do believe these dance forms will endure and the ground work has been happening and is still happening now.